The housing market appears headed for a strong spring season. After a brief setback in December, the Pending Home Sales Index resumed its climb in January, posting a 2 percent gain over the month prior. The data puts pressure on Coto de Caza home buyers. This is because a “pending home” is a home that’s under contract to sell, but has not yet sold. It’s tracked by the National Association of REALTORS® and, among all housing statistics, it’s the only one that’s “forward-looking”. The Pending Home Sales Index is important to home buyers throughout California because 80% of homes under contract to sell close within 60 days of contract. In this way, the Pending Home Sales Index forecasts the housing market 1-2 months into the future. This is very different from how NAR’s Existing Home Sales report works; or, how the Census Bureau’s New Home Sales report works. These two metrics tell us what’s already happened in housing. By contrast, the Pending Home Sales Index tells us what’s coming next. January’s Pending Home Sales Index reading lifts the monthly metric to its highest level since April 2010 — the month during which the 2010 federal home buyer tax credit expired — foreshadowing a strong housing market through March and April 2012, at least. This should not be news, of course. The nation’s home builders have said “foot traffic” is rising and home supplies are scarce nationwide. The only wild-card for housing is the high contract cancellation rate. As compared to last January when just 9 percent of home purchase contracts “failed”, this January saw 33 percent of contracts fail. High failure rates undermine the Pending Home Sales Index’s viability as a forward-looking housing market indicator. Despite contract failures, though, the combination of low mortgage rates and low home prices is enticing to today’s home buyers. Expect home sales to climb in the coming weeks which will lead to a strong spring season for housing. The new construction market rolls on. As foreshadowed by February’s Homebuilder Confidence survey, which rose to a 4-year high, the Census Bureau reports new homes are selling more quickly than builders have built them, lowering the national “home supply” to levels not seen since 2006. A “new home” is a home that is considered new construction and, at the current pace of sales, the nation’s entire new home inventory of 151,000 homes would be sold in 5.6 months. Anything less than 6.0-month supply is thought to connote a “sellers’ market”. 321,000 new homes were sold last month on a seasonally-adjusted, annualized basis. 7 of 10 new homes sold for less than $300,000. The South Region continues to account for the majority of new construction sales, posting a 59% market share in January. South Region sales were up 9 percent as compared to December. The other 3 regions turned in mixed results. Unfortunately, the Census Bureau’s New Home Sales data could be wrong. Although New Home Sales were said to fall by about one percent nationally from December to January, the government’s monthly report was footnoted with a ±16.6% margin of error. This means that the actual New Home Sales reading may have been as high as +15%, or as low as -18%. Because the range of values includes positive and negative values, the January New Home Sales data is of “zero confidence”. However, that’s not to say that it should be ignored. The aforementioned homebuilder confidence survey shows builders optimistic for the future, and a bevy of home sale data since October 2011 suggests a market in recovery. If you’re in the market for new construction in Trabuco Canyon , therefore, consider going into contract sooner rather than later. Home prices remain low and mortgage rates do, too — a terrific combination for today’s buyers. In a few months, the landscape may look different. Mortgage markets improved in a holiday-shortened week last week, drawing mortgage rates lower throughout Coto de Caza and nationwide. Few new economic releases reached the markets, but those that did suggested recovery — especially with respect to housing and employment, two key drivers of the U.S. economy overall. Mortgage rates tend to rise when on strong data. That’s not what happened last week, however. First, in housing, the New Home Sales and Existing Home Sales reports each showed strength for December and January. Separate reports show that sales volume is rising nationwide even as the number of available homes for sale fall. Home Supply is reaching bull market levels, which pressures home prices higher. 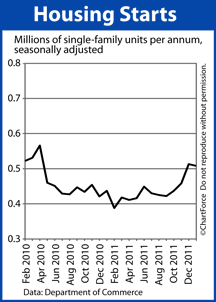 And then, in employment, the government’s Initial Jobless Claims report turned up good news, too. The report’s 4-week moving average is now down to its lowest level since 2008, a figure that suggests that U.S. households are getting back to work and staying there. As rate shoppers in California , don’t expect rates to fall forever. Last week’s rate improvements were partly because the Greece bailout has yet to be finalized, and partly because concerns about Iran have sparked a mortgage bond flight-to-safety. International demand for U.S.-auctioned bonds was especially high last week and mortgage bonds benefited. As the situations in Greece and Iran stabilize, therefore, all things equal, mortgage rates should rise. There are just two key data points set for release this week — the Pending Home Sales Index (Monday) and Personal Income and Outlays (Thursday) — plus two key European votes on the Greece bailout. The Case-Shiller Index will also be released and the FHA is expected to announce new mortgage insurance premiums. Mortgage rates remain near all-time lows. If you’re still floating a rate, or waiting to refinance, consider moving up your timeframe. It’s a good time to lock your mortgage rate for the long-term. 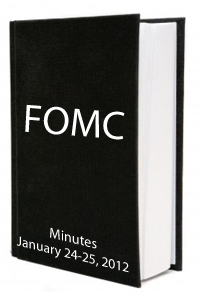 The Federal Reserve has released the minutes from its 2-day meeting January 24-25, 2012. The Fed Minutes is a summary of the conversations and debates that shape our nation’s monetary policy. It receives less attention than the Fed’s more well-known, post-meeting press release, but the Fed Minutes is every bit as important. To rate shoppers in Coto de Caza , for example, the Fed Minutes can provide clues about whether mortgage rates will generally rise or fall in the coming months. The most recent Fed Minutes reveals a central bank divided on the future of the U.S. economy. The minutes show some Fed members in favor of new, immediate market stimulus. It shows others in favor of terminating the stimulus that’s already in place. The Fed’s debate centered on the topic of inflation, and the pressures that a prolonged, near-zero Fed Funds Rate can place on the economy. Ultimately, the Fed did nothing, neither adding new stimulus nor removing that which is already in place. It did, however, communicate a plan to keep the benchmark Fed Funds Rate rate “exceptionally low” through late-2014, at least. Furthermore, the Fed expressed optimism regarding European financial markets, noting that market sentiment “appeared to brighten a bit”. Nonetheless, “spillovers” remain possible and the threat continues to weigh on markets. Mortgage rates are slightly worse since the Fed Minutes were released. The Federal Reserve’s next scheduled meeting is March 13, 2012 — its second of 8 scheduled meetings this year. 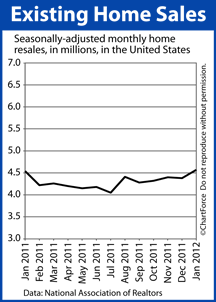 January’s home resales moved to a 20-month high — additional evidence that the nation’s housing recovery is underway. According to the National Association of REALTORS®, the January 2012 Existing Home Sales showed 4.57 million units sold last month on a seasonally-adjusted, annualized basis — a 4 percent increase as compared to December’s revised figures. An “existing home” is one that’s been previously occupied and cannot be categorized as new construction. Beyond the headline numbers, though, there was plenty about which for today’s Coto de Caza home sellers to get excited. 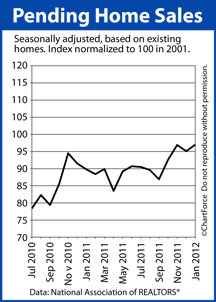 Demand for homes remains strong, foreshadowing higher home prices through 2012. First, the national housing stock is at a 5-year low. In January, the number of homes for sale nationwide slipped to 2.31 million, the smallest home inventory since February 2007, and a 21% decrease from just one year ago. Falling home supply amid constant home demand leads home prices higher. At the current pace of sales, today’s complete home inventory would “sell out” in 6.1 months. Analysts say that a 6-month supply is a market in balance. Anything less is Bull Market territory. Second, the National Association of REALTORS® says that one-third of all homes under contract “failed” last month. This means that many more buyers tried to buy, but couldn’t for a number of reasons including mortgage denials; or, insurmountable home inspections issues; or, homes appraising for less than the contract price. As contract failures subside, Existing Home Sales are expected to rise even faster. And, lastly, first-time buyers continue to power the home resale market. In January, 33% of all sales were made to first-time buyers, up four points from last year. This statistic suggests that renters are moving into homeownership, an important component in a sustained housing market recovery. Given high demand and shrinking supply, we should expect for Orange County home prices to rise in the coming months, if they haven’t already. Thankfully, mortgage rates remain near all-time lows. Low mortgage rates make homes more affordable. Foreclosure filings fell 19 percent last month versus one year ago, says foreclosure-tracking firm RealtyTrac. It’s yet one more signal that the U.S. housing market may have already climbed off its bottom. According to RealtyTrac, a “foreclosure filing” is any one of the following foreclosure-related events : (1) A default notice on a home; (2) A scheduled auction for a home; or, (3) A bank repossession of a home. On a monthly basis, however, the numbers weren’t so promising. Default notices and scheduled auctions were mostly unchanged, but bank repossessions rose 8 percent. The rise in bank repossessions is likely because 2010’s robo-signing controversy has been rectified at the state and lender level. 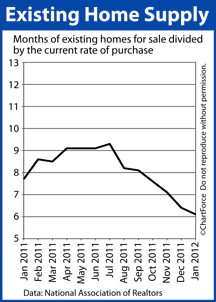 This trend toward more bank-owned homes is expected to continue through 2012. As in most months, January’s foreclosure activity was geographically concentrated. 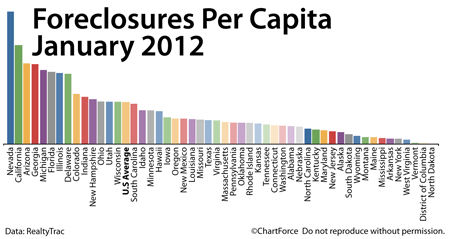 Nevada led the nation in Foreclosures Per Capita, followed closely by California. 13 states fared worse than the national average of 1 foreclosure per 624 households. 37 fared better. North Dakota had January’s lowest foreclosure rate nationwide. Just 1 in 63,500 homes was in some form of foreclosure in North Dakota last month. As a first-time or seasoned buyer in Trabuco Canyon , foreclosed homes can be enticing. They’re plentiful and cheap. However, just because a foreclosed home can be bought for a “steal”, that doesn’t mean it’s worth buying. The process of buying a foreclosed homes is different from the process of buying a non-foreclosed home. The contract-and-negotiation process may be different with a foreclosed property, and foreclosed homes are often sold “as-is”. This means the home you buy at auction could be run-down and defective to the point where it’s uninhabitable. If you plan to buy a foreclosed home, therefore, have a real estate professional on your side. The internet can teach you much about how the California housing market works, but when it comes to writing contracts, you’ll want an experienced agent on your side. Mortgage markets worsened last week as the Eurozone moved closer to a bailout agreement with Greece, and the U.S. economy displayed more signs of growth. In response, mortgage rates climbed last week. Rate shoppers should not be surprised that rates ticked north. Since mid-2011, weakness in Greece has helped keep mortgage rates low and the same is true for a weak U.S. economy. Wall Street has sought “safe assets” as protection from risk and that’s driven mortgage rates down. Now, the safe haven buying that served to anchor low rates appears poised to reverse. Last month, it was shown, consumer spending rose to record levels and the housing market surpassed analyst expectation again. Homebuilder confidence is now at a 4-year high and Single-Family Housing Starts topped one-half million units for the second straight month. Conforming mortgage rates in California rose for the first time in a month last week. Unfortunately, few shoppers knew because Freddie Mac’s weekly mortgage rate survey failed to capture the change. The survey deadline was Tuesday. Rates started rising Wednesday morning. Freddie Mac’s weekly mortgage rate survey put the average 30-year fixed rate mortgage unchanged at 3.87% for borrowers willing to pay 0.8 discount points plus a full set of closing costs. Beyond Greece and the U.S. economy, inflation is another reason mortgage rates are up. Inflation is the enemy of mortgage rates and, an on annual basis, the core Consumer Price Index registered 2.3% — it’s highest reading since 2008. 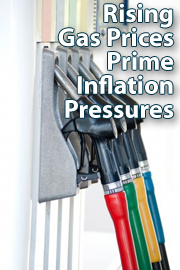 The Fed expects inflation to ease later this year but if gas prices stay high, the Fed’s forecast may be wrong. This week is holiday-shortened. Look for Greece to dominate headlines (again) and watch for housing data toward the end of the week. Existing Home Sales is released Wednesday. New Home Sales is released Friday. For now, mortgage rates remain low. It’s a safe time to lock a long-term rate. Housing Starts Stay Strong; Building Permits Rise. The housing market has carried forward its year-end momentum. According to the Census Bureau, on a seasonally-adjusted, annualized basis, January’s Single-Family Housing Starts crossed the half-million unit marker for the second straight month. This hasn’t happened in close to 2 years and is the latest in a series of strong data that suggests the beleaguered housing market has turned a corner — both nationally and locally in Rancho Santa Margarita. Although single-family starts slipped 1 percent from December, January’s annualized 508,000 figure represents a 16% spike from January 2011 and is the second-highest reading since April 2010 — the last month of 2010’s federal home buyer tax credit program. A “housing start” is a new home on which construction has started. The strength of January’s Housing Starts data surprised Wall Street analysts and is partially responsible for Thursday’s unexpected mortgage rate spike. In hindsight, though, we should have seen this coming. Earlier in the week, the National Association of Homebuilders announced that homebuilder confidence had climbed to its highest point since 2007 amid builder reports of rising sales volume and the most foot traffic from buyers in more than 4 years. In addition, builders expect to sell more homes in 2012 than in 2011. Builders are building and buyers are buying. Meanwhile, as another sign of housing market strength, the Census Bureau reports that, in January, Building Permits moved to a multi-year high as well. Permits issued for single-family homes in January rose 1 percent from December, a statistic that suggests housing will continue its run through the spring season, at least. 86 percent of homes break ground within one month of permit issuance. It’s a good time to be a home buyer. Mortgage rates and home prices are low. Housing market momentum, however, is building. If you’re on the fence about whether to buy a home in Orange County , ask your real estate agent for additional market information. The cost of home-ownership may never be as low as it is today. 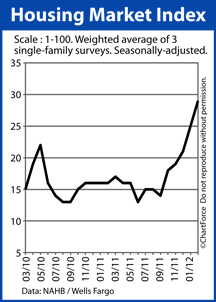 Comments Off on Housing Starts Stay Strong; Building Permits Rise. New construction buyers in Coto de Caza , look out. 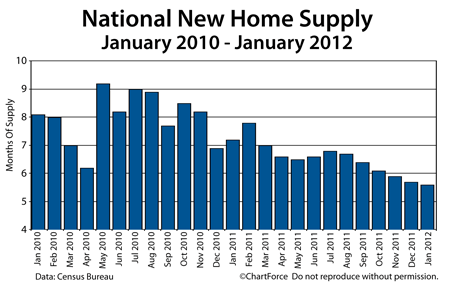 The nation’s home builders are predicting a strong 2012 for new home sales. It may mean higher home prices as the spring buying season approaches. For the sixth straight month, the National Association of Homebuilders reports that homebuilder confidence is on the rise. The Housing Market Index climbed four points to 29 in February, the index’s highest reading since May 2007. The Housing Market Index is now up 8 points in 8 weeks. The last time that happened was June 2003, a month during which the U.S. economy was regaining its footing, much like this month. It’s noteworthy that June 2003 marked the start of a 4-year bull run in the stock market that took equities up 54%. The NAHB’s Housing Market Index itself is actually a composite reading. It’s the end-result of three separate surveys sent to home builders monthly. How are market conditions for the sale of new homes today? How are market conditions for the sale of new homes in 6 months? How is prospective buyer foot traffic? In February, builders reported marked improvement across all three areas. Builders report that current home sales climbed 5 points; that sales expectations for the next 6 months climbed 5 points; and that buyer foot traffic climbed 1 point. Most notable of all of the statistics, though, is that the nation’s home builders report that there are now twice as many buyers setting foot inside model units as compared to just 6 months ago. This data is supported by the monthly New Home Sales report which shows rising sales and a shrinking new home inventory. Because of this, today’s new home buyers throughout California should expect fewer concessions from builders at the time of contract including fewer price breaks on a home and fewer free upgrades. Builders are optimistic for the future and, therefore, may be less willing to “make a deal”. This spring may mark the best time of year to buy a new home. 60 days forward, it may be too late.